The Fernao de Magalhaes is a friendly and comfortable 3 deck ship that sails on the Douro river. 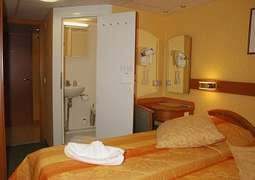 All cabins are fitted out to give them a maximum of space and light and feature warm colours and furnishings. Beds are two single beds. They have a Floor to Ceiling window. Choose between varied dishes and enjoy the extensive range of culinary delights.All your meals are already included in the total trip price. With the exception of specialty restaurants on board, where there will be an additional charge. Of course inclusive with every meal drinks are served with a selection of drinks available. To welcome you on vacation and totally accustom you to your trip, a welcome cocktail on board is included in the tour price. On the Fernao de Magalhaes you will be well entertained throughout the day. A very popular and special event with guests is the gala dinner of The Captain. The glamorous evening program will be replaced on other days by artistic entertainment.